LG V20 is a one the best smartphone available in the market and includes many qualities that make it preferable for almost everyone. LG V20 has a powerful processor, excellent camera, strong battery and awesome display. There are many awesome reasons to buy LG V20 which we shared with you a few days before. If you have bought LG V20 recently, there are few things that you have to do after booting up the device for the first time. Here in this article we have listed all those features that can prove to be highly useful and mentioned those things that are advisable to be done after purchasing LG V20. All these features can be enabled by following simple steps. 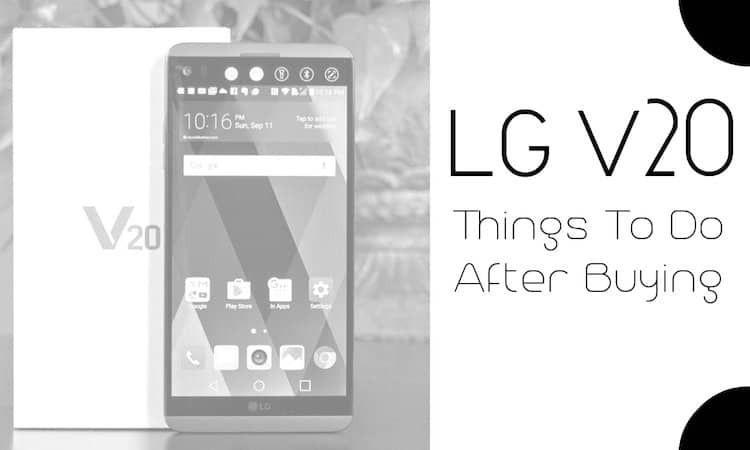 So, let’s have a look at some of the important things to do after buying LG V20. 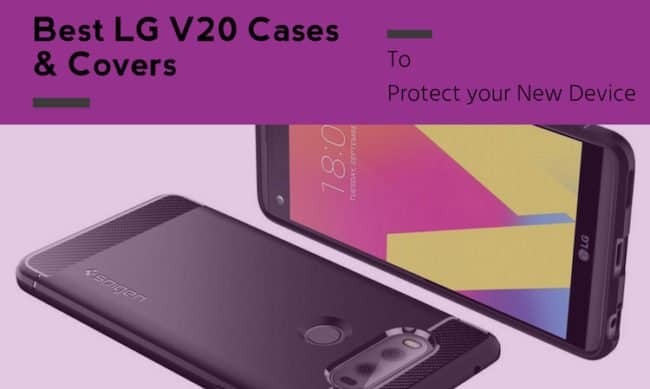 LG V20 has a durable body that provides a good amount of protection but still due to its large display (which is prone to accidental drops) it is advisable to cover it with a case that not just keeps the screen safe from any unwanted scratch and dust but also gives you the chance to change the look of you device. 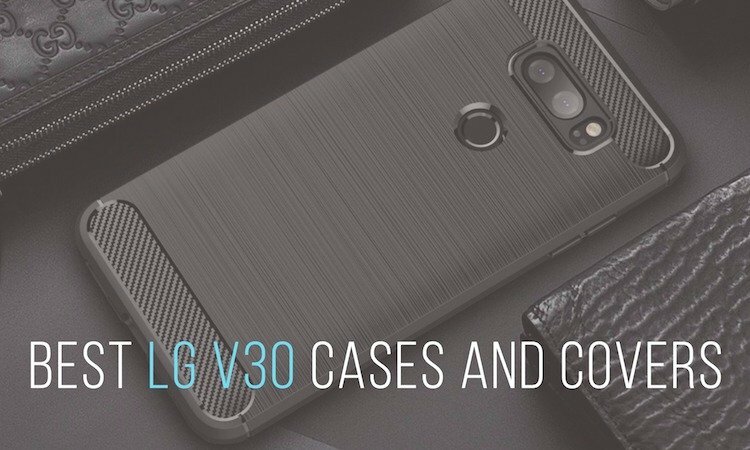 You can find the collection of best LG V20 cases and covers from here. 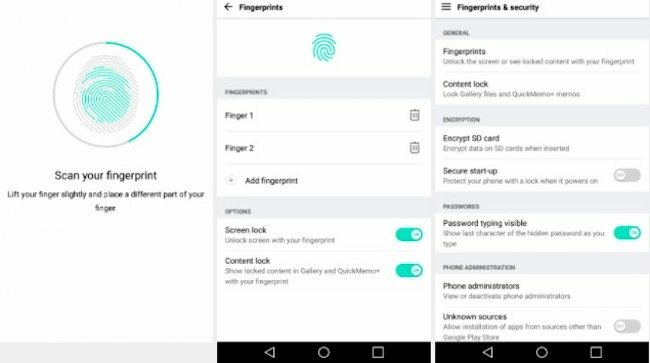 When you buy and turn on the LG V20 for the first time, it takes you through the setup process and in between ask you to record your fingerprint and choose a backup method to unlock the device. After that, we recommend users to save additional fingerprint to unlock the content in a secure manner by following the steps given below. LG V20 has a large display and usually the icons and text are huge which may not suit some of the users. Though, the latest Android Nougat allows users to customize the display as per their convenience. LG V20 runs on Android Nougat and has a UI skin at the top of it which has certain things that may seem unfamiliar. 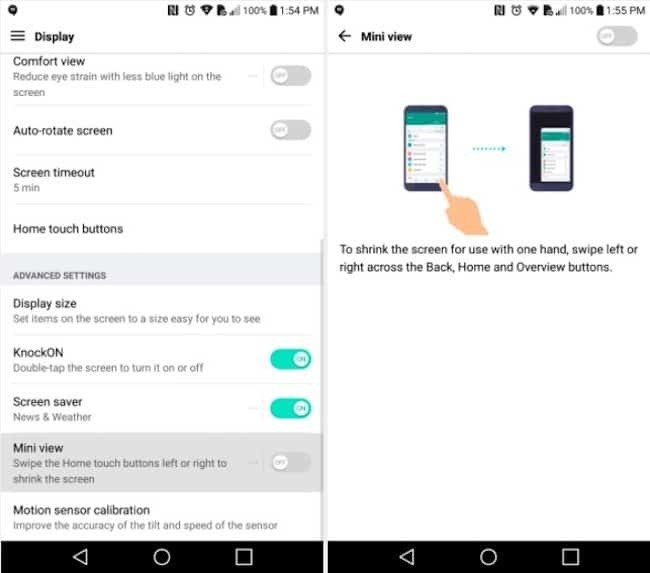 For instance, by default the navigation bar that incorporates on-screen buttons is white looks too bright, specially in low light conditions that’s why it is advisable to change the colour to black. You won’t find the App Drawer on the default Home Screen and to get that back you need to replace the home screen with the option provided by LG. Once you get the new Home screen, Tap on three vertical dot Menu icon and select View app by to open App Drawer which will help you next time to find any app quickly. Initially the Secondary display of LG V20 looks like nothing more than a trick intended to grab attention but once you set it up, it proves to be very useful. You can easily take the advantage of multiple options available and add most commonly used apps without any hassle. It will show you two options Show when the main screen on and Show when the main screen off, tap on the words instead of the toggle button and it will bring more options in front of you such as Quick Tools, App Shortcut etc. Smartphones are expected to improve our daily life and LG might have made the V20 with the same mindset that’s why the phone includes an innovative feature called Smart Setting that automates small but important functions that affect us a lot, all you need to do is just set them up once. 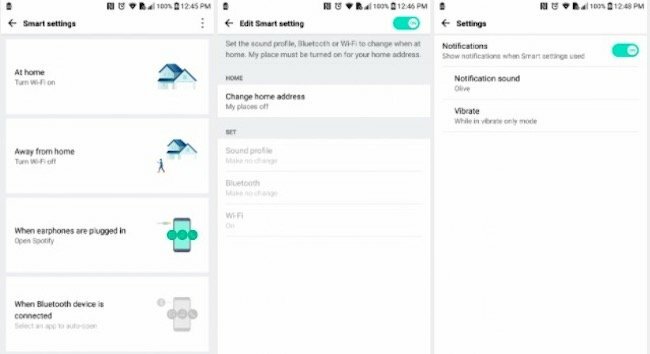 The first two options would be At Home and Away from Home that will allow the phone to turn Wi-Fi/Bluetooth on or off while coming to or leaving home automatically. The other two options are When earphone plugged in and When Bluetooth device is connected to open any specific app accordingly. It is always risky to hand over the phone to someone else to make a call or use a specific application for a while because you phone contains sensitive data. 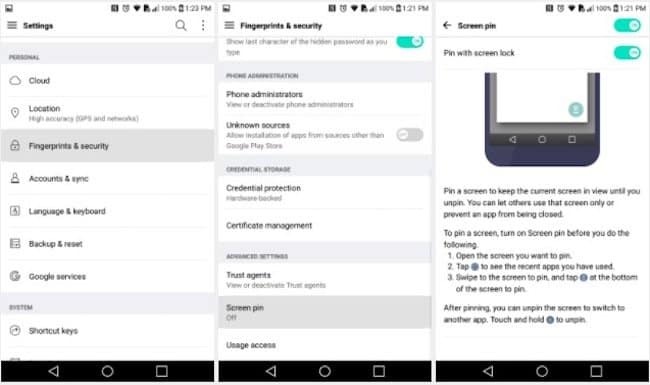 The LG V20 users can restrict other people from accessing your confidential data and lock them on a particular app or screen through Screen Pin feature. The battery of the phone drains out quickly and the device also turns hot when you play a video game. Some games like Pokémon Go use the GPS of the phone as well, which increases burden on CPU. LG V20 has a feature that reduces the frame rate and turns down the screen resolution while playing a game and extends your battery life namely Game Battery saver. At the bottom you will find Game battery save, tap on the words rather than the toggle switch to get more options. The last option let you choose from three levels of resolution and frame rate, normal, low and high. 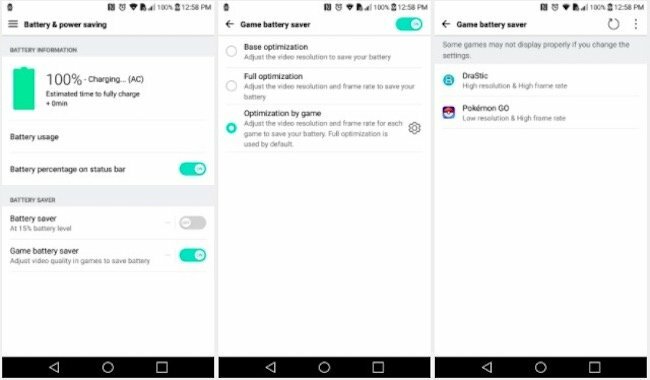 You can tweak those settings to achieve optimal performance of individual games and save battery at the same time. LG V20 offers fast and smooth navigation and there are multiple ways to enhance the make user interface more catchy. For example, you can enhance the speed of animations and it will eventually improve your viewing experience too. The LG V20 has an in-built feature called ‘Android Device Manager’ that helps you the to recover the phone or erase all the sensitive data if your phone is lost or gets stolen. In order to make the most of it you should know how to use it. You will see a map showing your device and displaying three options Ring, Lock and Erase that can be used to find the phone, lock it if it wasn’t unlocked and erase the data/content to keep up your privacy . 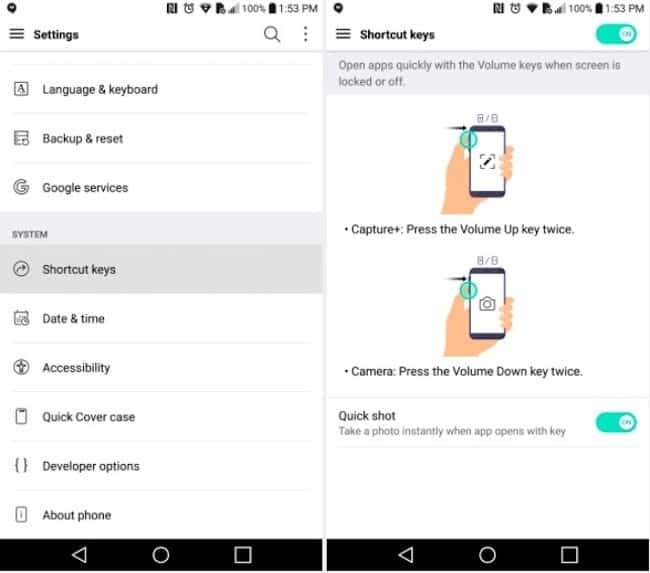 The LG V20 features few shortcut keys that help you to access specific applications quickly. For instance, you can press volume up key twice to turn capture+ feature on and volume down key twice to turn the camera on. You can also enable an additional feature called quick shot to take pictures immediately after turning on the camera. We capture most of our precious movements from out phone camera and store those images in the device but in case if the phone gets stolen or due to any reason we format the phone then we loose all those pictures. LG V20 users can backup their images in Google Photos for free and can recover them anytime as per their need, you can store videos upto 1080p in Google Photos too. There are multiple options to customize your photo or video backup such as While charging only that allows back up only when the device is plugged into the charger and you can choose to backup over cellular data of when connected to Wi-Fi. 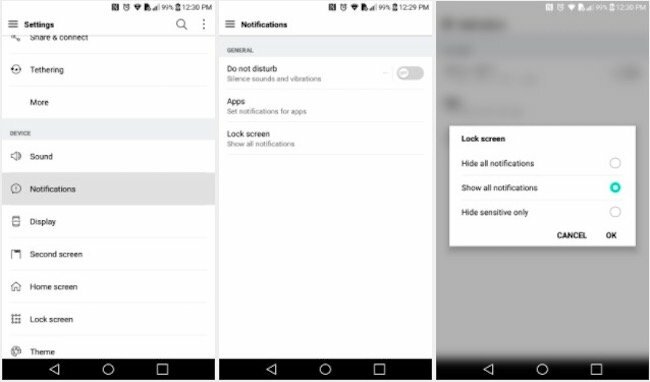 Usually the LG V20 doesn’t showcase any sensitive data on the lock screen, but if you want to see your messages and notifications from social networking app over there then you can alter settings anytime. LG V20 is a powerful device that is backed with the next generation Android Nougat and offers multiple useful features to enhance the telephoning experience of the users. We can make the most of this extraordinary phone by enabling the above mentioned features and make the device most suitable for our daily task and routine. Awesome thanks for the tips! I prefer a lot of on-screen space. I have a Samsung Note 3. It is a true 5.7 screen with control buttons on bottom panel. I run apps that use a lot of space like long lists of stocks, options, etc. V20 is advertised as a 5.7 screen like the Samsung Note series. to less than that of an Apple 7 plus screen space. Can those Controls b turned off? Or hidden? If not, then I would prefer an Apple 7 Plus or a legacy Note 5 LTE. Too bad they ruined the screen size with not so cool controls. They are customizable but remain on Unless you’re using apps, watching videos, taking pics/videos, then they disappear. They really aren’t a big deal. I came from Note 4 and the v20 blows the pants off it. Plus the specs, when you compare it to Isuck7, galaxy7, pansypixel etc, are hard to beat. Its very durable and has a tough screen unlike iPhone screens that break too easily. The camera is incredible for a phone, so if you’re like me and use your phone for taking pictures then this is the way to go. I can’t get my notifications to make noise on my v20. I have them set up but no sound comes. I get the notifications in the notification screen but no sound. Can someone please help. Thank you. I have an LG V20 that I love. Several things happened last week and I lost the real second screen icons. Calls to LG and Spring Tech have been a waste of time. I’d had five apps set permanently but they’re gone. How do I bring up my choice of apps again? (I don’t have a case cause I’m disabled and don’t move around much.) I set the phone to tell it it has the LG case, but no joy, whether not I tell it there’s a case. What am I missing or did some fool update these icons out of existence? Thanks for the info you’ve posted. Notifications sound can be unset a couple of places. Make sure you haven’t shut if notifications in the app list under Settings. Back in Settings, under General, Sound Profile, make sure it’s set to Sound (you can add Vibrate below). Next, go down to Sound, Volume, and make sure Notifications is loud enough to hear. As far as selecting the various sounds, some are not loud enough to wake me, but I can sleep through explosions and gunfights (life in the city), so I expect most folks hear them fine! This phone is terrible it will not send text messages…they claim it’s bc the phone is too advanced. I’m livid & now stuck with 2 that don’t work. I have a V20 and it sends text messages like any other Android phone – just faster. LG V20 is a good phone, but I have to desagree about the “strong battery”. My Lg G5, with MY normal use, last about 2 days, this V20 lasts one day. So I think something is wrong, maybe the second display uses to much battery….. I frequently will not receive a text from an iPhone user. Is there anything I can do to fix this? Different app? I just ended up with an LG v20 H990ds (the dual sim version) It is a shame that LG didn’t unlock the bootloader considering this is the international carrier unlocked version. I ended up rooting it via a complicated process on XDA-developers but it sounds to me that this would have been a killer phone it they allowed unlocking the bootloader.